Though she began her career as a particle physicist, Erdoğan is now an acclaimed Turkish writer and journalist who has covered such charged issues as state violence and human rights. An honorary advisor to a pro-Kurdish newspaper, she was arrested in 2016 and jailed for nearly five months, accused of supporting terrorism. She was eventually released and currently lives in Frankfurt, Germany. The Stone Building and Other Places captures the relationship between place and mind with the claustrophobic feel of a prisoner pacing a cell. Thoughts repeat and turn back in on themselves, over and over, like a prisoner counting first the stones in the wall, then the cracks in the stones. It is sometimes difficult to tell how much of what we read exists outside the narrator’s mind. Narration flows from one character to another until it is at times impossible to discern first from third person. Though this translation into English was published only in 2018, this collection originally came out in 2009, long before her imprisonment and exile. She was awarded Turkey’s prestigious Sait Faik Short Story Award. Many years later Erdoğan has said her experience of solitary confinement was much more difficult than she had ever imagined. The book is organized into a novella and three stories that are referred to in the title not as stories but as “places,” which seems appropriate to Erdoğan’s style. Whether these are four different places, though, is not entirely clear. A stone building appears in nearly every story. Also present are hearts of stone and stone-faced masks. Imprisonment and exile run through the pages like threads designed to help us find our way through the building’s tunnels. The second story, “Wooden Birds,” is the most plot- and character-driven in the book. This is one of her best-known works, winner of the Deutsche Welle Prize in 1997. Its lighter touch stands in contrast to the other stories. Its delightfully unexpected ending suggests a rethinking of Odysseus’ story about the Sirens that resonates in our #metoo moment. In a 2017 interview, Erdoğan spoke about a novel she has been working on for years, one that revisits the cells and tunnels of this stone building as a metaphor for Istanbul. 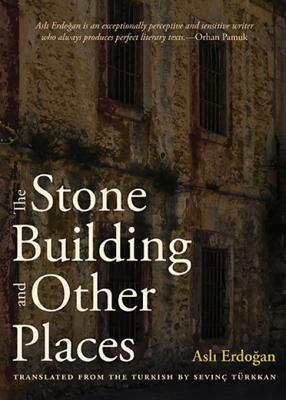 The Stone Building and Other Places is only the second of Erdoğan’s books to be translated into English, and we had to wait eight years for it to appear. Let’s hope we will see her next book much sooner.